The 30th of April is Valborgsmässoafton, Walpurgis night, in Sweden, when we celebrate the arrival of spring with singing and bonfires. Students are especially active during Walpurgis night but the celebration goes back to medieval times and like so many other Swedish traditions it has it´s roots in northern Germany. 20.45 Speech "Welcoming the spring" - Göran Rosenberg, journalist & writer. Entrance to Skansen is free on the 30th of April for students with a valid student id. Choral singing is a popular pastime in Sweden, and one occasion when nearly every choral singer in the country lets rip is the evening of 30th April, known as Walpurgis Night or, more strictly as Walburga´s Eve (Valborgsmässoafton) being the eve of the feast of Walburga, which comes on 1st May. Bonfires are lit, often on hilltops where they will be visible from a long way off, and when the crackling of the fire is at it´s height, a number of gentlemen (though increasing numbers of ladies are also appearing nowadays) step forward, most of them wearing peaked caps with a white top and some kind of lyre emblem above the peak, resembling the caps which high-school graduates wear on this evening. They proceed to sing a number of songs, which are the same everywhere in the country and maintain that this evening marks the end of winter and the coming of spring. Rather touching if, meantime, sleet and snow are bidding fair to put the fire out, but most years, in the south of Sweden at least, spring is well into its stride. Choral singing is a late and middle-class addition to the ancient practice of gathering round a fire on the evening before May Day, and probably derives from the manner in which students in Uppsala and Lund have been celebrating the arrival of spring for two centuries now. But the bonfire goes back further than that. In Sweden, and many other countries too, the lightning of bonfires one evening in the spring was an ancient custom, and it is a moot point among scholars whether this was done to scare off predators before the cattle and the sheep were put out to graze, or whether there was some supernatural, magical purpose involved, as for example when the Germans sought out to protect themselves against the witches gathering on this very night, Walpurgis Night, to worship the devil. 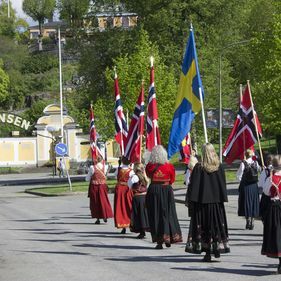 The Swedish custom is descended from the virulent Walpurgis fires of north Germany, and since most German immigrants were to be found in Stockholm, and its surroundings, this is where the custom first took root. Other parts of Sweden had other bonfire evenings, but the capital city, of course, always sets the tone of things, and so the bonfires and the singing have now fallen in line with the Stockholm way of doing things.